Invited for a media preview of the food festival, each one of us was asked to choose a particular cuisine. 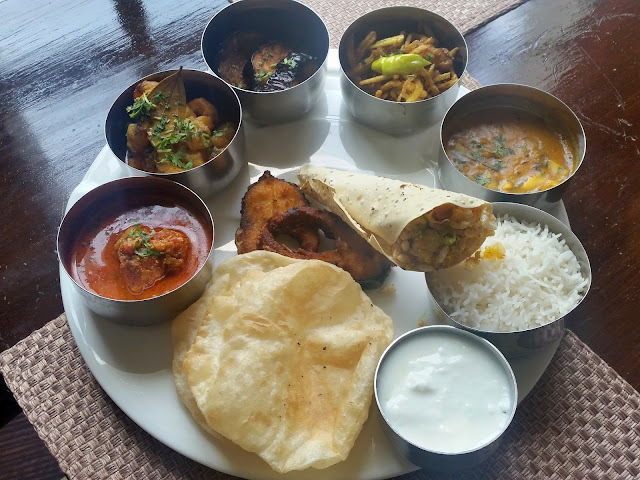 Malvani and Karwar were the two I was less familiar with, and after a brief thought I chose the Karwar non-vegetarian thali. I was happy that my neighbours chose Goan and Kerala cuisine, so that I could nibble a bit from their platter too. Karwar is a coastal town in the northern part of Karnataka. 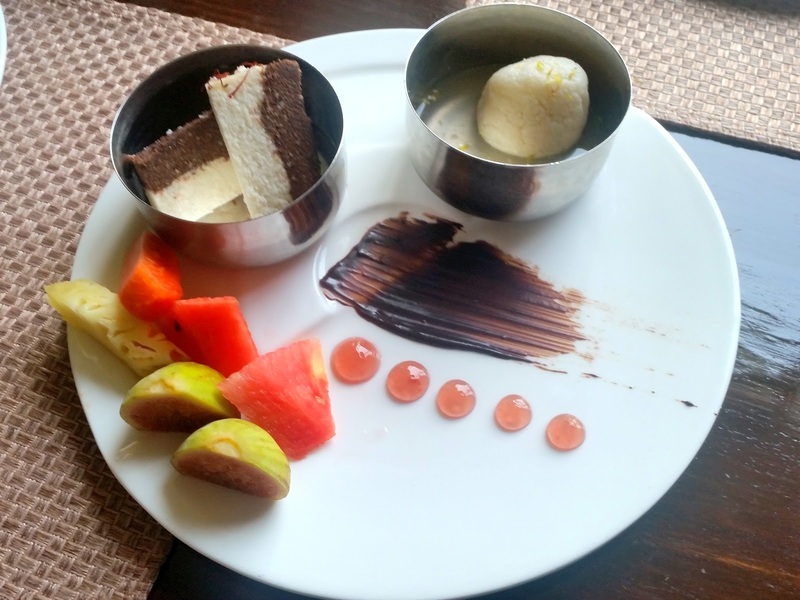 Being close to South Goa, the cuisine has strong influences of the Goan cuisine. The Karwar meal started off with some refreshing Sol Kadhi, prepared from kokum, coconut milk and spices. A healthy drink, it is consumed just like rasam in the west coast meals, either at the beginning or along with the meal. 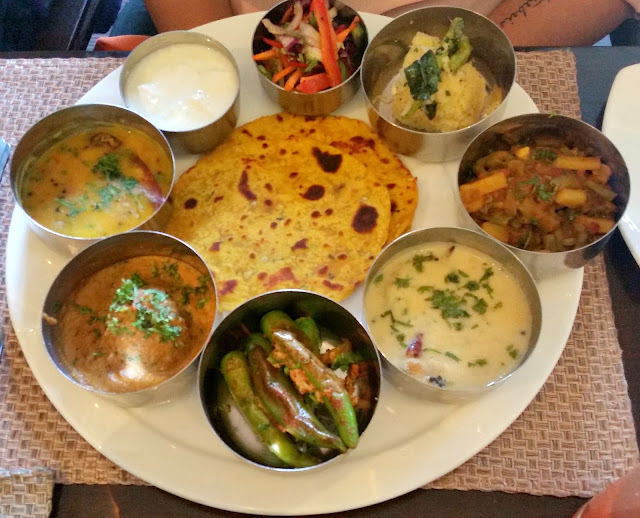 The main thali which followed soon had three vegetarian and three non-vegetarian items apart from Jowar Roti, rice and curd. The first to get my attention, the Char Grilled Marinated Red Snapper had a perfectly done fish in a spicy marinade. The fish was fresh and the soft meat came off easily from the solo central bone. Next, I tried the vegetarian dishes with the rustic Jowar Roti. Vaali Bhaji is made from palak and other green leafy vegetables, it went well with both roti and rice. Valachi Amti, a spicy recipe made of bean sprouts and garnished with coriander was quite wholesome. The non-veg dishes had the signature coastal Karnataka dish, Kori Gassi. This chicken curry in a spicy coconut based gravy is a recipe from the Bunts of Udipi. Karwari Seegadi had medium sized prawns in a delightful coconut based masala. I liked all the non-veg items, though the fish was clearly my favourite. The initial portions in the thali were quite decent. One great thing about this fest is that the portions are unlimited, you can ask for a refill of anything you wish. After trying out everything on my plate, I went shopping at the other thalis. The Konkani Black Mutton was perhaps the best among the good non-veg dishes that were served. Bangade Dhoddak, or Mackarel in Goan masala could not compete with the Karwar Red Snapper. 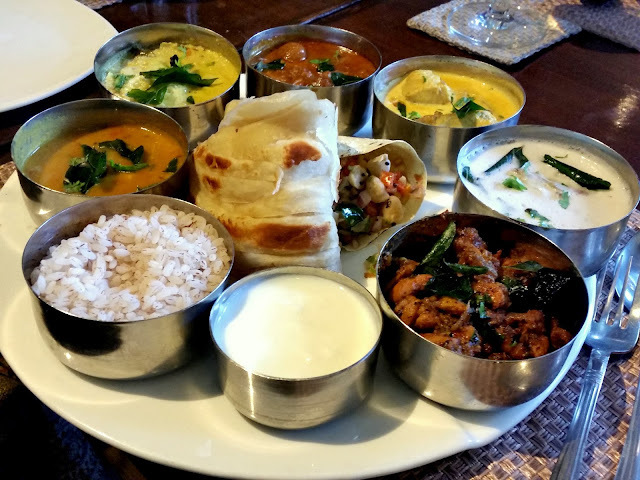 In the Kerala thali I liked both the dry Nadan Chicken Fry as well as the stew. Some Jhal Muri being passed around from the Bengali thali was delicious. It was presented in a nice way with a folded papad acting as the traditional container or thonga. Though jhal muri is more of a snack and not served with thalis in Bengal, the taste made me overlook this. The Kathiawari thali had some delightful Paneer Mirchi Fry. Finally the desserts. The Karwar Thali had Paradi Payesha, a rice pudding with jaggery and coconut. I liked the Ragi Halwa, but my favorites were in the other thalis, the Konkan Bebinca, Gujarati Shrikhand and the Bengal Chocolate Sandesh. 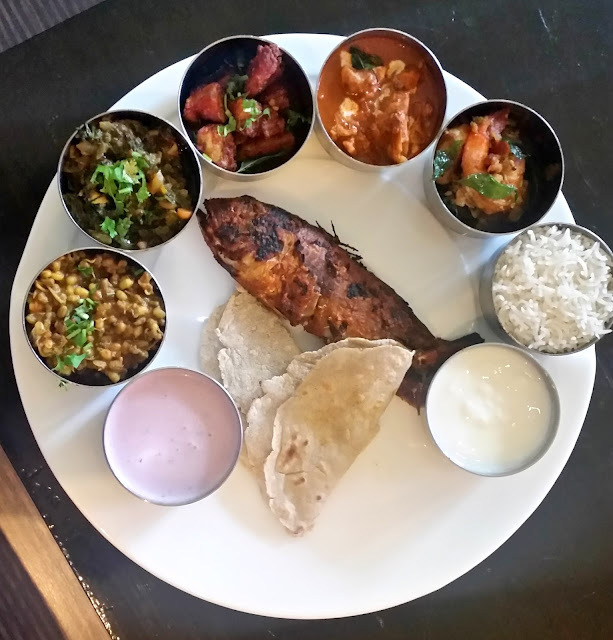 The Thali Festival is on till 20th November, for both lunch and dinner. It gives the food lovers an unique opportunity to try out the home food of different parts of India. The pricing is Rs 800 (plus taxes) for vegetarian thali and Rs 900 (plus taxes) for non-vegetarian. Also see: Slice of Real Life talks in detail about the Bengali thali. For details of the Konkani thali, read The Calorie Misfit’s review here. What did the Bengali thali have? 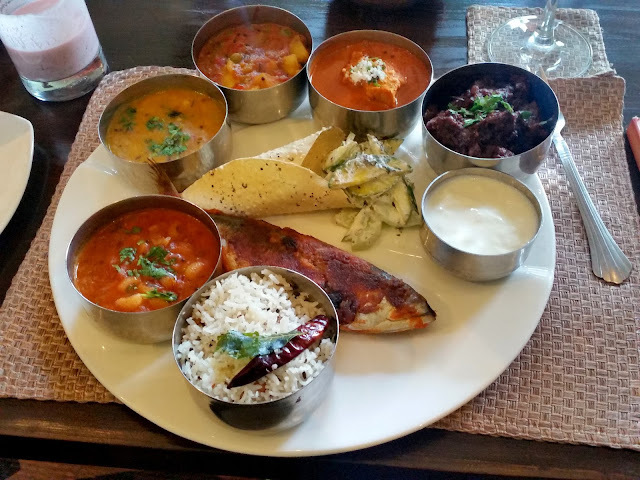 Goan thali has essentially a Pinkish Rasam which is missing. Rest all is okay. That rasam is made up of Kokam. Do they organize in other parts of India as well? Yes, the thalis were absolutely delicious. This was a Taj hotel, so they must be having the same festival at their other locations too.